Combining the classic and enduring elegance of a crisp white shirt with our Mara&Meru™ design features, the Great White Shirt is a chic and stylish fashion choice for work, travel, or everyday wear. The feminine design of the Great White Shirt makes it a classic wardrobe favourite. Made from high quality stretch poplin, the sides of the shirt are tailored with the curves of the body in mind, giving it shape and form. It is also darted in the front and back for a flattering fit. The unimposing side slits are a subtle design feature that complement the overall look of the shirt. 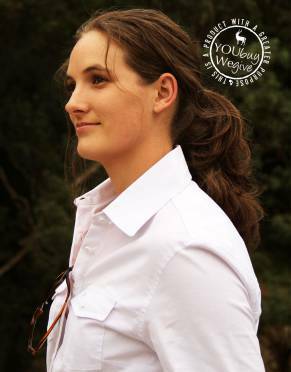 The Mara&Meru™ Great White Shirt has two chest pockets which can be closed by means of a button. These functional additions also serve to further enhance the design of the shirt. 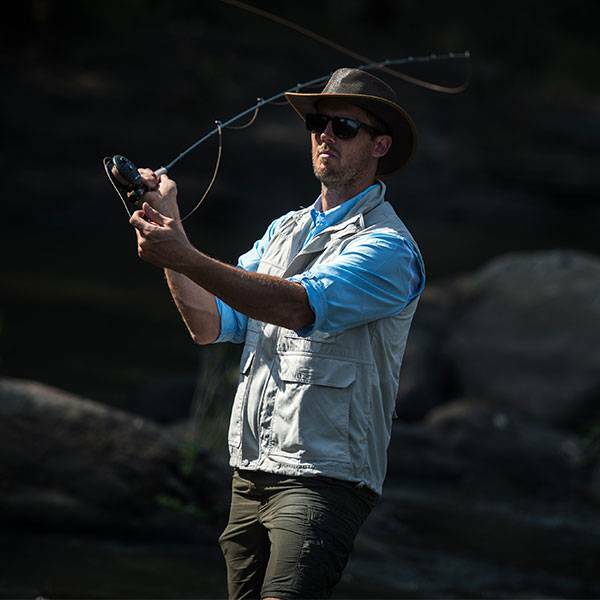 The single button and loop system on the sleeves allows for the long sleeves to be comfortably, conveniently, and stylishly rolled up and fastened. 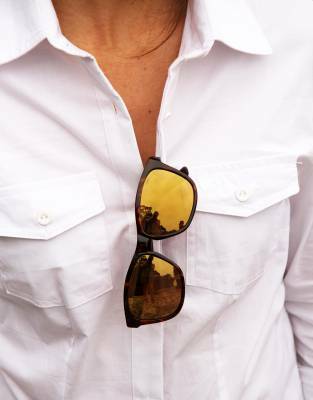 The sunglasses loops on the inside of the shirt are an industry first and were designed to secure your sunglasses to your shirt to stop them falling out when you bend over. 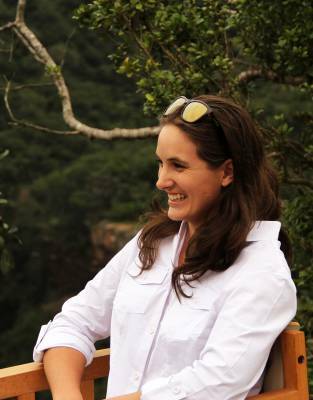 With classical styling in a colour that never goes out of fashion, as well as functional, convenient design features from the Mara&Meru™ range, this shirt is perfect for wearing at the lodge between game drives or as a stylish travel shirt. 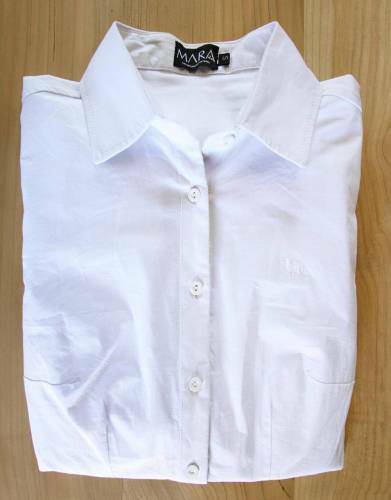 Incorporate the Great White Shirt into your every day for work, casual wear, or dressed up as a smart option for dinners or more formal occasions. ⊙ MATERIAL: Made from 100% highest quality stretch poplin. 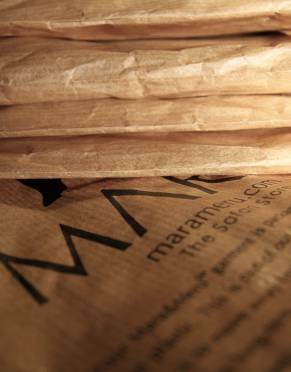 ⊙ FIT AND DETAIL: The Mara&Meru™ Great White Shirt is a classic button-up shirt which is slightly fitted on the sides. Front and back darts and small, subtle side slits make for a great fit and contribute to the overall styling of the shirt. 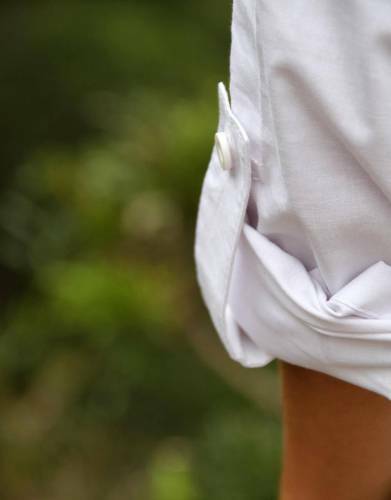 ⊙ SINGLE ROLL-UP SLEEVE TABS: The long sleeves with single-button cuffs of the Mara&Meru™ Great White Shirt can be rolled up and secured by the subtle single button and loop sleeve tabs! ⊙ SUNGLASSES LOOPS: An industry first! Many of us carry our sunglasses hooked over the top button of our shirts but, as we all know, our sunglasses often fall out when we bend over. We tested and trialled new sunglasses loops on the inside of the shirt. To prevent your sunglasses from falling out, simply use the first loop to secure them in place. If you are doing more active outdoor activities or for extra peace of mind, loop through the top and bottom loop. It is a simple solution, but highly effective. *By its very nature, stretch poplin wrinkles relatively easily. 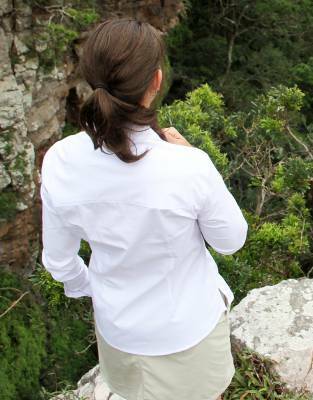 When travelling, we advise hanging the Mara&Meru™ Great White Shirt on arrival at your hotel or lodge. ⊙ MATERIAL: Made from the highest quality stretch poplin. Please wash as per the instructions on the label. Help us improve our products even further by sending us feedback to service@thesafaristore.com. Three easy steps to ordering the right size: ⊙ With so many different brands from all over the world available on the high street and online, the only way to get your size right the first time round is to compare a garment you own and which fits you well with one of our garments. STEP 1: ⊙ You will need a measuring tape, a flat surface such as a table, a notepad to record your garment's measurements - and your own collared long sleeve shirt which is a comfortable fit. ⊙ Tip: If you do not have a measuring tape, use your credit card. The long side of a credit card measures 8.5cm and the short side is 5.4cm. Simply use the centimetre measurements on our chart and divide by 8.5cm to get an idea of how many credit card lengths equals the measurement you are recording. STEP 2: Referring to the images above, place your shirt flat on the table and record the following measurements: ⊙ 1/2 Bust/Chest - Across the front of the shirt from armpit to armpit; ⊙ Centre Back Length - From the nape of the neck on the back of shirt to the bottom hem; ⊙ Sleeve Overarm - From the top of the sleeve where it joins the shoulder to the end of the cuff. STEP 3: Compare your measurements with our size chart and order the size closest to your measurements. Chest/bust is usually the most important measurement if you are in a hurry, but checking all three will make for the most comfortable fit.